Barossa’s climate, from temperature and sunlight hours, through to prevailing winds and rainfall, plays a defining role in the character and quality of wines produced each season or vintage. The majority of the world’s wine producing regions are found between the temperate latitudes of 30° and 50° in each hemisphere, and Barossa is no exception, sitting at approximately 34° South of the Equator. Described as a Mediterranean climate, Barossa typically experiences cool, wet winters and warm, dry summers, which is ideal for grapegrowing. The winter months (June – August) bring cold days, some rain and cold nights. From September through to February there are plenty of sunny days, which encourage the vines to grow and allow the grapes to ripen fully and develop a balance between levels of acid and sugars in the grape. Rainfall during this period is usually quite low, which means that supplementary irrigation is sometimes used. 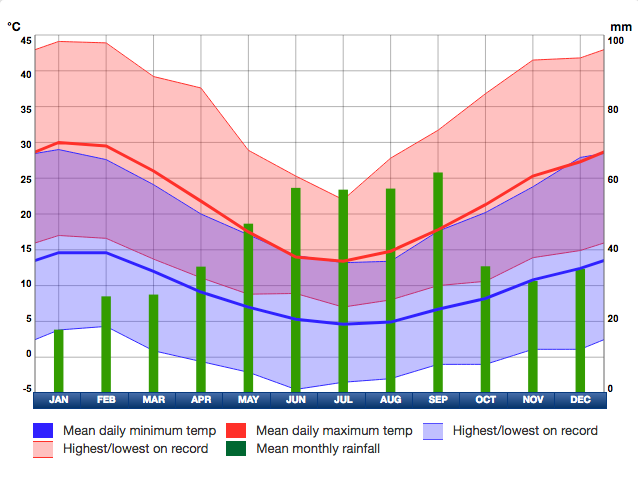 The autumn months during harvest (March – May) are usually mild but sunny with cool nights. Temperatures vary from warm on the valley floor to progressively cooler at the higher altitudes of the Eden Valley, and together with the hills and valleys within, produce a wide range of meso-climates. Warm and dry, with low relative humidity and rainfall in the growing season. With long daily sunshine hours, the viticultural temperature average is only slightly warmer than that of Bordeaux (France) and the Margaret River (Western Australia). Harvest generally runs from mid-February to late April. The Barossa Valley is typified by gentle rolling hills and valleys. Plenty of sunshine on the deeper valley soils promote healthy vine growth, but excess vigour is often restricted by shallow soil and a lack of water holding capacity. The main viticultural hazard for the Barossa Valley is drought. Altitude is all-important in determining the meso climate (or local climate), although aspect and slope are also important in the varied, hilly terrain. Thus the vineyards at an altitude of about 500 metres or above are noticeably cooler than the vineyards located at about 380 – 400 metres above sea level. Overall the growing season temperatures are significantly lower than those of the Barossa Valley, and the final stages of ripening (and harvesting) take place in much cooler conditions. Eden Valley is also considered a temperate ‘Mediterranean’ climate, but compared to the Barossa Valley, its higher altitude results in wetter, cooler weather and daytime temperatures being 2 – 3°C cooler than the Barossa Valley floor. On clear nights, Eden Valley can be 5 – 7°C cooler than the Barossa Valley floor, which slows ripening, enhances cool climate flavours and ensures greater retention of natural acidity. The main viticultural hazard for the Eden Valley is autumn rain and frosts.